01:10:00 Makes 24 servings, 1 cupcake (78 g) each. Makes 24 servings, 1 cupcake (78 g) each. Do you love it when your baked creations get oooh's and ahhhh's? This fun dessert is guaranteed to lead to one of those moments. Simply cluster cupcakes on a baking sheet, and frost the entire bunch of them together to look like one big cake. Decorate to resemble a monster's face, then let the kids serve themselves by pulling it apart. Prepare cake batter and bake as directed on package for 24 cupcakes, blending dry pudding mix into batter before spooning into paper-lined pans. Cool completely. Beat cream cheese, butter, vanilla and food colouring in medium bowl with mixer until well blended. Gradually add sugar, beating well after each addition. 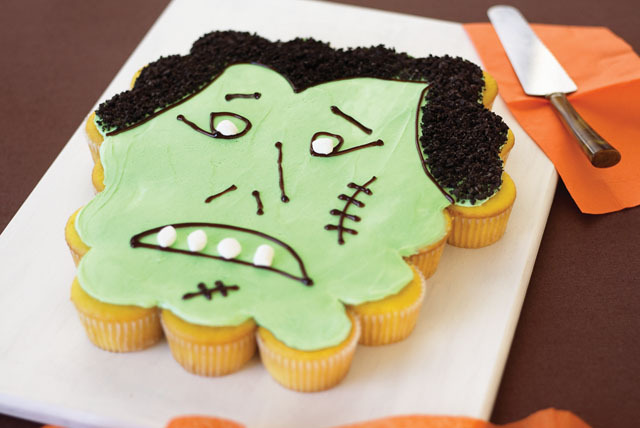 Arrange cupcakes on large platter or tray to resemble a monster's head; spread with cream cheese frosting. Use decorating gel to outline the eyes, mouth, scars and hairline on the cupcakes. Fill in the hair with cookie crumbs. Place 1 marshmallow half in centre of each eye; place remaining marshmallow halves in mouth for teeth. Keep refrigerated. Prepare as directed, using any flavour cake mix. Prepare cupcakes and frosting as directed, omitting the green food colouring. Arrange cupcakes in triangular shape on platter, with 1 cupcake in the top row, 2 cupcakes in the second row, 3 cupcakes in each of the third and fourth rows, 4 cupcakes in the fifth row and 6 cupcakes in each of the sixth and seventh rows. Reserve 1/2 cup plus 2 Tbsp. of the frosting. Spoon 3/4 cup of the remaining frosting into separate bowl; stir in 4 drops yellow food colouring and 2 drops red food colouring until well blended. Add 6 drops yellow food colouring to larger amount of the remaining frosting. Frost the 6 cupcakes in the top three rows with the white frosting; frost the 7 cupcakes in the middle two rows with the orange frosting and frost the 11 cupcakes in the bottom 2 rows with the yellow frosting. Keep refrigerated. Let your imagination run wild and create your own unique cake. Just assemble the cupcakes into a shape such as a ghost, jack-o'-lantern or witch face, then frost and decorate. It's easy! Serving Size Makes 24 servings, 1 cupcake (78 g) each.